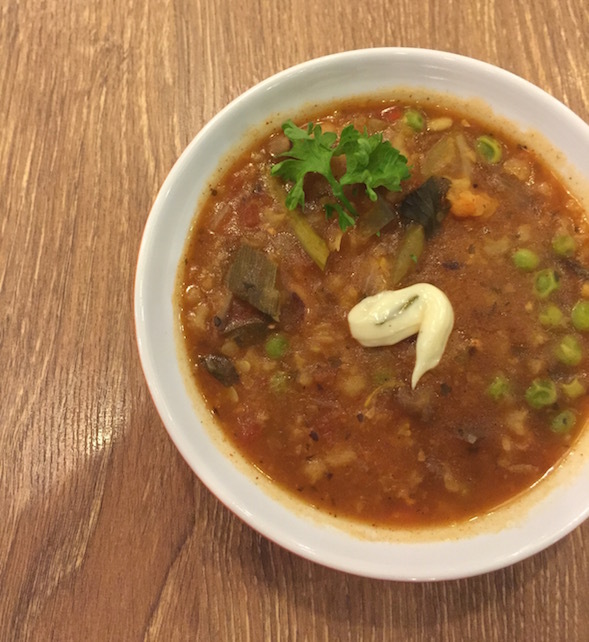 I go to The Soup Spoon rather often, popping by their Raffles Place MRT outlet at least twice a month for a quick lunch or a leisurely dinner. To me, The Soup Spoon has always been about a warm, comforting bowl of soup that takes me away from my busy work day. There’s something calming about a warm soup that you can’t get from a crisp salad. 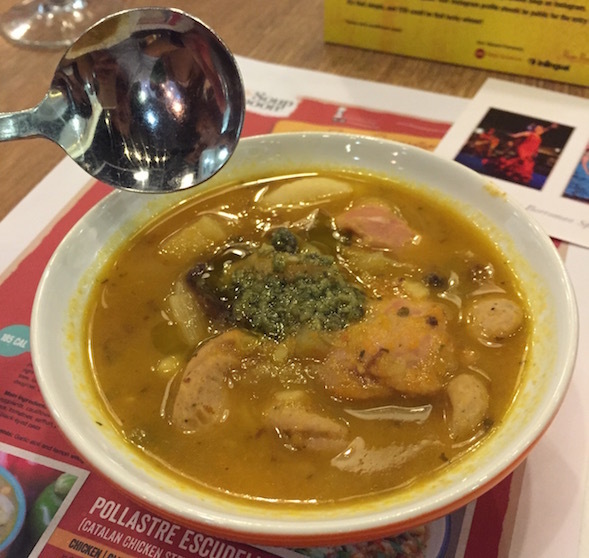 That’s why I jumped at the chance to taste The Soup Spoon’s new range of 3 Spanish-inspired soups recently! Yum Yum. I Can’t resist a good soup. The evening was a dinner made out of soups were inspired by SouperChef Anna’s 15 day journey through the regions of Basque, Castile, Aragon and Catalunya. The first soup we tried was a serving of Catalan Chicken Stew with Prunes. The stand out ingredient in this one was actually the pureed carrot. The carrots lend the soup a slightly yellowish-orange tinge of sweetness that really helped to bring out the flavour of the other ingredients. As expected from The Soup Spoon, the marinated chicken thigh was hearty and in sync with the Spanish theme. If you’re worried that the prunes would overpower the rest of the flavours, don’t be! You’ll just taste a touch of it. This is easily one of the most well-balanced soups in the range and I would recommend that everyone try this one at least once! The Vegan Rice with Ratatouille Casserole is gluten free, egg free and dairy free. In other words: perfect for Vegans. This Vegan casserole’s inspiration is a distinctly non-vegan in nature. The original Arroz a la cassola was a soupy squid ink rice with chicken and seafood. It probably explains why SouperChef Anna chose to add a good amount of rice into this soup. Together with potatoes, carrots, bell peppers and a mish-mosh of other very nutritious vegetables. For me, this soup could have been a bit more special if they used barley instead of rice. Barley would be firmer, and lend a certain texture and sweetness to the soup. The other thing is the asparagus – it was fibrous and tough and I spent a good 5 minutes chewing down on one stalk. If you’re vegan or if you really really love vegetables, this is your soup. Otherwise, you might want to go for one of the other two soups. The Basquaise Spicy Seafood Stew is the seafood lover’s choice. Inspired by the undisputed gourmet stronghold that is the Basque country, it brims with seafood goodness. You can taste the sea in this soup, with some solid Barramundi fish, mussels, prawns and squid. The mussels, especially, lent some serious flavour to the soup. 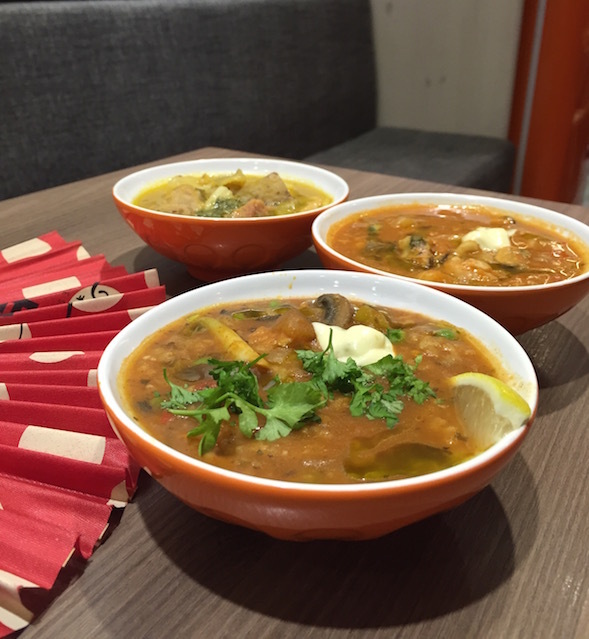 The spiciness of this soup opens up the palate and kept me wanting that next sip of tastiness! I loved how full of flavour this soup was, and I’ll definitely want to have this again when I visit! I must say the flavours are a mixed bag, with the soups not being made equal. There are, however, some solid choices with the Spicy Seafood Stew and the Catalan Chicken Stew. The flavour profiles are varied enough to have a little something for everyone, even Vegans aren’t left out this time round. I must say, they took a bit of a creative risk with these soups but if anyone has the chops to pull it off, it’s The Soup Spoon. The Soup Spoon is having an epic giveaway! They’re sending one of you lucky soup drinkers and a loved one to Spain! 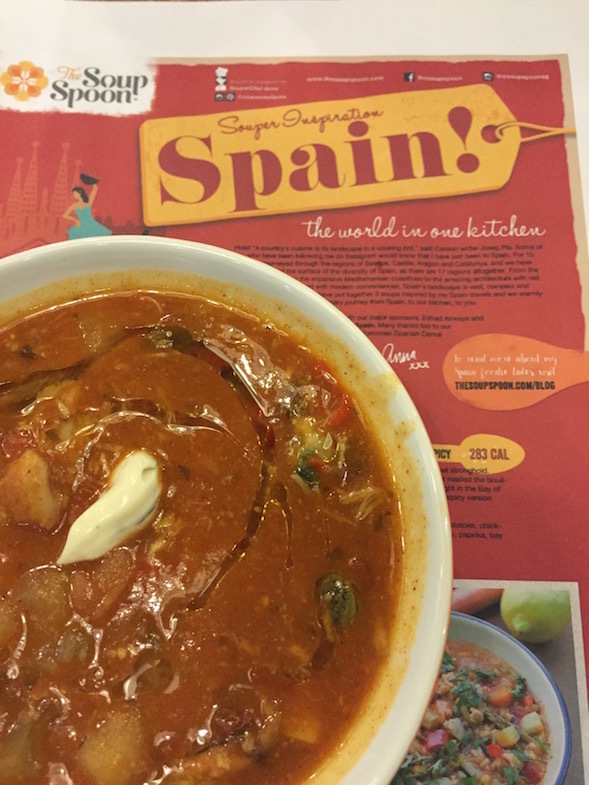 To enter, simply purchase one of their Spain Souper Inspirations soups, then fill out your receipt with your name, mobile number and email address, and drop the receipt into the lucky draw box in stores.